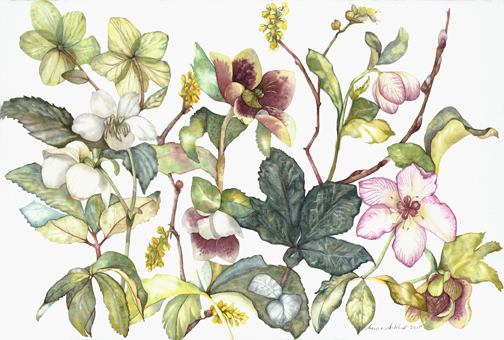 Lots of new work, and way behind in putting them online, like this 18″x24″ watercolor of Hellebores. Great minds! I spent some time today on the site, enjoying the older ones, and now THIS gorgeous piece! Made my evening. Thanks! When will more be available? Soon, very soon. Tomorrow? Thanks for your comment. You are currently reading Hellebores 1 at Marcia Mitchell.